In his fifth effort in the director’s chair, George Clooney has delivered another satisfying and thoughtful film. The Monuments Men tells the mostly true story of the US soldiers who scurried around Europe finding, saving and returning the art that Hitler plundered. Cleverly structured and lovingly designed like classic World War 2 films, The Monuments Men is a more honorable version of Kelly’s Heroes. In both films, a ragtag group of men is on a mission to retrieve treasure behind German lines. In both films, the cast is eclectic. 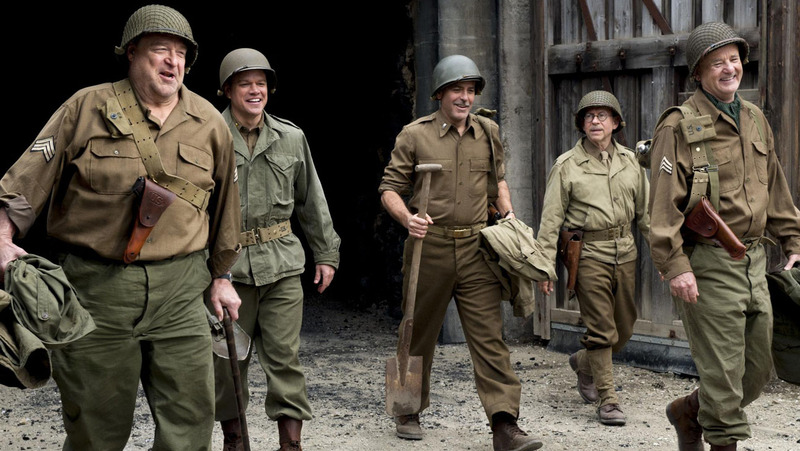 In the case of The Monuments Men, Clooney is joined onscreen by Matt Damon, Bill Murray, John Goodman, Jean Dujardin, Bob Balaban, Hugh Bonneville and Dimitri Leonidas. Cate Blanchett plays a circumspect curator at the Jeu de Paume, where she gathers crucial evidence of the Nazi’s plans for the art. The screenplay is by George Clooney & Grant Heslov, based on the book by Robert M. Edsel with Bret Witter. Clooney has a deft hand in the director’s chair, but at times the humor (although understated) seems to cast too light a tone on the gravity of the story. It is obvious the cast enjoyed donning helmets and uniforms; it is unlikely they will do so again. The quirky casting actually works well because the whole premise was that these were not soldiers but art lovers, academics and curators voluntarily thrust into saving much of the (Western) world’s art. Hugh Bonneville shifts adroitly from his well-loved role as the Earl of Grantham in Downton Abbey, here he is a recovering alcoholic looking for redemption. He finds it posthumously while saving Michelangelo’s Madonna. Bill Murray was recently seen as FDR (Hyde Park on the Hudson), which is ironic as Clooney’s character here is seen reporting to FDR as a framing device in the film. Murray has an uncharacteristically touching scene, in the shower no less. In much the same way that China Syndrome mirrored real life (the film appeared nearly contemporaneous with the Three Mile Island meltdown), The Monuments Men is in theaters while headlines report on stolen art discovered hanging in the German Parliament and a treasure trove of art found in the possession of a German whose father was ordered by Hitler to round up art by Picasso, Matisse and other masters. The film will spur interest in continuing the effort of finding the stolen art. Well played is the recurring theme of whether a man’s life is worth saving art.